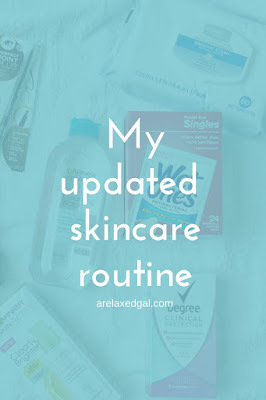 I realized that it’s been over a year since I shared the details about my skincare routine. Quite a few things have changed since then. The biggest changes are to my skin. I started seeing more pimple breakouts and a bit more shine pop-up at the end of the day. 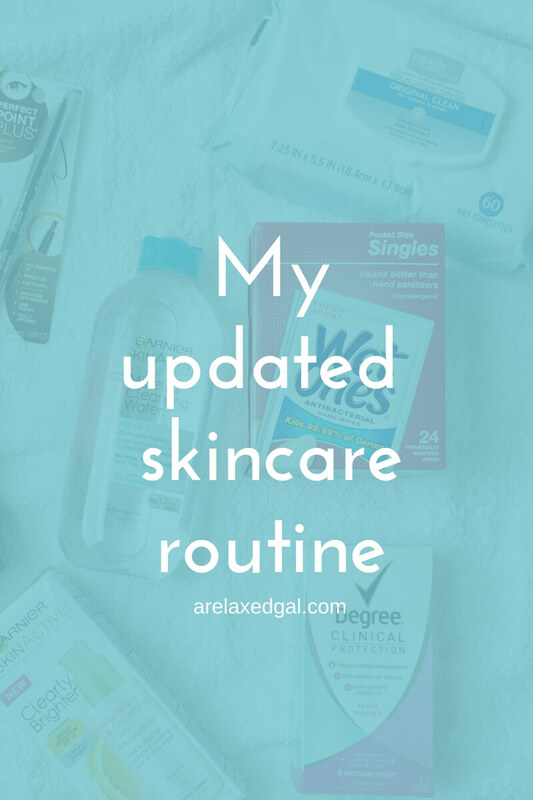 Because of that, I introduced some new products and steps into my morning and nighttime routines. I’m starting with my nighttime routine because it’s the one with the most steps It’s also probably the most important because it involves me removing my makeup from the day. I used to combine this step with step two which I found to be a mistake. By going straight to cleaning my face without first properly removing my makeup I was leaving a lot of makeup in my pores. I believe that over time the leftover makeup built up and started to clog my pores causing some of the breakouts I was experiencing. Now as part of my routine I’m removing my makeup using face towelettes. The ones I’m currently using are a store brand which is a few dollars cheaper than most of the name brands. 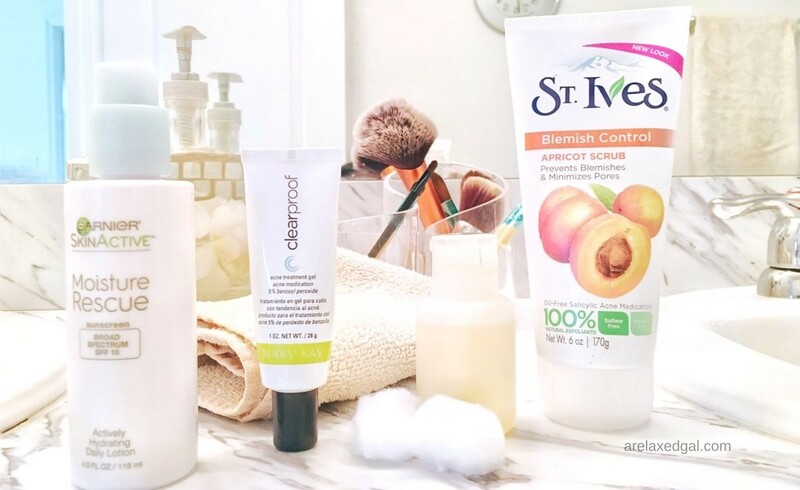 After removing my makeup with towelette, I clean my face using a store brand cleansing cream or the St. Ives Blemish Control Apricot Scrub. I only use the scrub about once a week now to exfoliate. I used to use it every day but decided it wasn’t necessary for me to exfoliate every day. A year ago I was using Mary Kay Clear Proof Blemish Control Toner for this step. Once that bottle was empty I didn’t replace with any other type of toner. That recently changed. As I talked about in my post about the DIY facial toners I started using a homemade toner to help get rid of any makeup or dirt that could be leftover after using the towelette and cleaner. When I first added a toner back into my routine I used a homemade toner made up of green tea, apple cider vinegar, and tea tree oil. After using that up I decided to try out Garnier’s SkinActive Micellar Cleansing Water All-in-1 Waterproof. It’s formulated to gently remove makeup, even waterproof makeup and refresh your skin. By using this I’m able to remove any last traces that are left in my pores. Before I combined this with the cleansing step but decided to make it a separate step in my updated routine. I sometimes skip over this step if I don’t have any pimples warranting the use of an acne blemish gel. I rotate between Mary Kay Clear Proof Acne Treatment Gel and a generic store brand acne gel. In my old routine, I used the Mary Kay Clear Proof Oil-free Moisturizer for Acne-Prone Skin. Once I used that up I decided to find a cheaper moisturizer that was formulated to be used at night. This led me to a store brand of night cream that’s supposed to smooth, soften and firm my skin. I’m not sure if it’s doing all of that, but I haven’t noticed any negative effects which is good enough for now. My morning routine is now less about cleaning my face and more about creating a base for my makeup. Because I’ve been in bed asleep for most of the time since I last washed my face, there isn’t much to remove from my face. 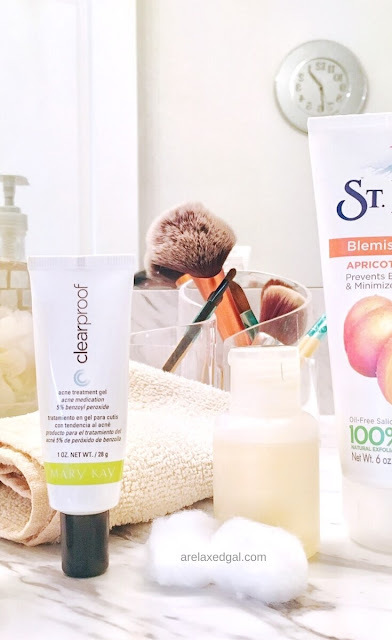 To wash my face in the morning, I either use St. Ives Apricot Blemish Control Facial scrub or a store brand cleansing cream. To determine which cleanser I use depends on how my skin looks and feels. If I'm noticing a few new breakouts, or my skin is looking dull I use the St. Ives Scrub. If my face still has a glow and looks good, then I use the cleansing cream. It tends to net out that I use the St. Ives Scrub about once a week and the cleansing cream the rest of the time. My face tends to not be that dirty in the morning since all I'd been doing since I washed my face at night was sleeping in my bed. So when it comes to cleansing in the morning it's a quicker process than at night. When I use one of the other cleansers I either don't tone or I use my homemade toner. As with my nighttime routine, I rotate between using Mary Kay Clear Proof Acne Treatment Gel or a generic store brand acne gel if any pimples may have popped up overnight. Ambi Even and Clear Daily Moisturizer with SPF 30 used to be my go-to moisturizer. In order to spend less money on my beauty products, I started using another Garnier product - Garnier Moisture Rescue Actively Hydrating Daily Lotion w/SPF 15. While I like the lightness of this lotion and it doesn’t make skin feel greasy or oily, I do wish the SPF was greater. After this step, I start applying my makeup. What are the steps in your skincare routine? What products do you use? Share in the comments, I’d love to hear from you.